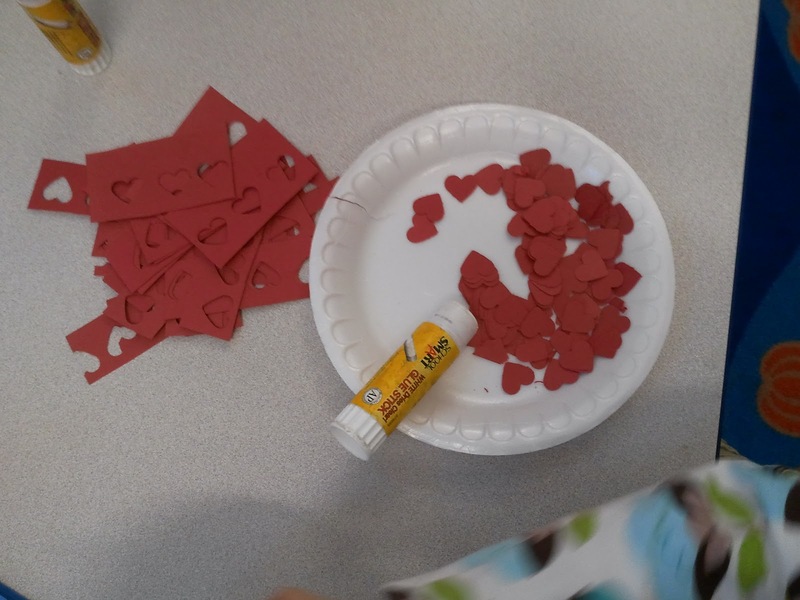 Paper phrases like "Be Mine," "Happy Valentine's Day" and "Hugs and Kisses," plus paper valentine decorations to fancy things up. 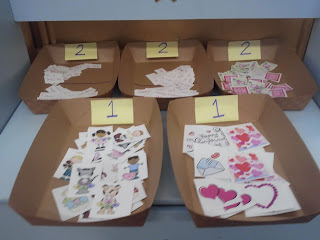 I ended up having to number each container because some of my little girls were slathering their cards with about 234354 decorations. Here are some of the cards in action. Later I added large paper hearts for them to use as cards also. There were also tons of sparkly stickers to jazz things up a little. This was a last minute and super easy gift for the little ones to give their parents. 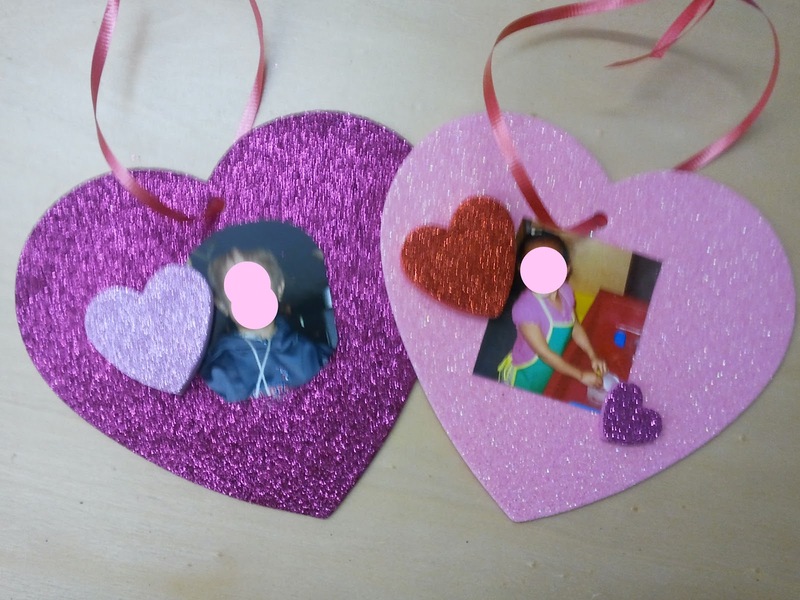 They cut and glued a photo of themselves (well okay, we might have helped a little...) onto a foam heart that I grabbed on sale at Michael's. They wrote their names and the year on the back, hole punched it and strung a ribbon through. Voila! A super fast and easy gift. Ms. C made these adorable "Love Bugs" with them. I love how they all looked a little silly and different. 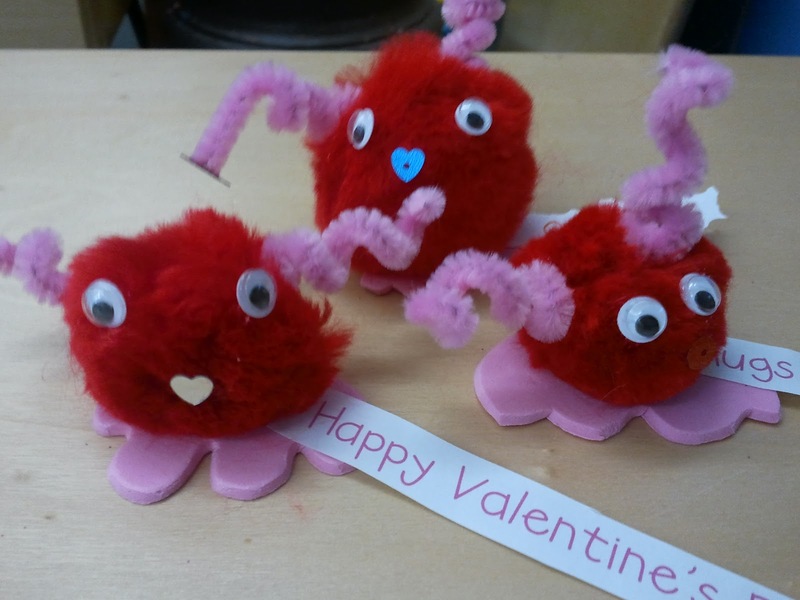 She used foam for the feet, a large pom pom, googly eyes and bits of pipe cleaner with a little glue. Then they glued on a little Valentine's message from the writing center. Ta Da! 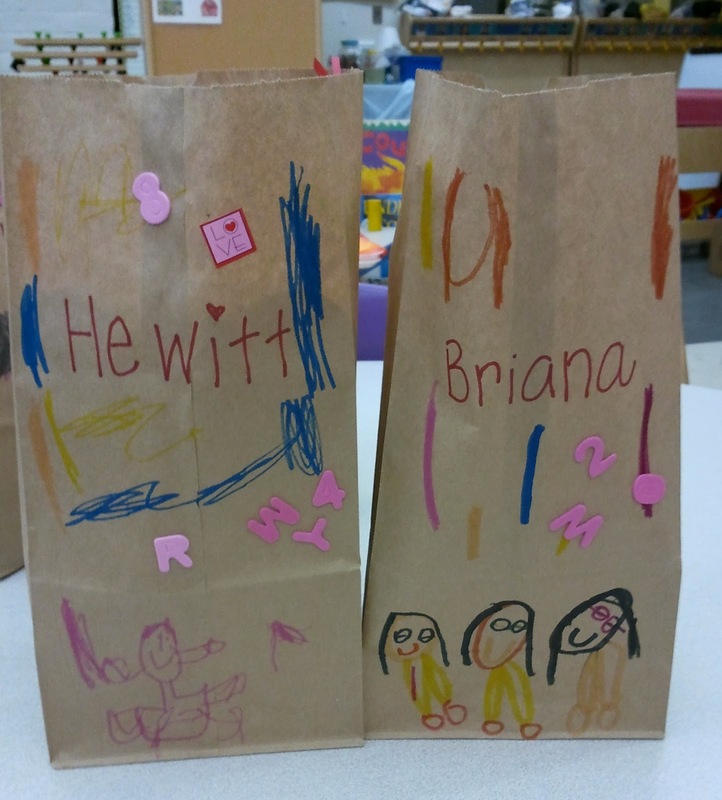 Even though some of the card holder ideas I have seen on Pinterest are WAY cuter than these, sometimes I just love to let the kids go crazy decorating their own bags. 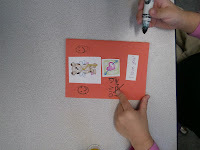 I had tons of stickers out, but they really seemed to like drawing the best. 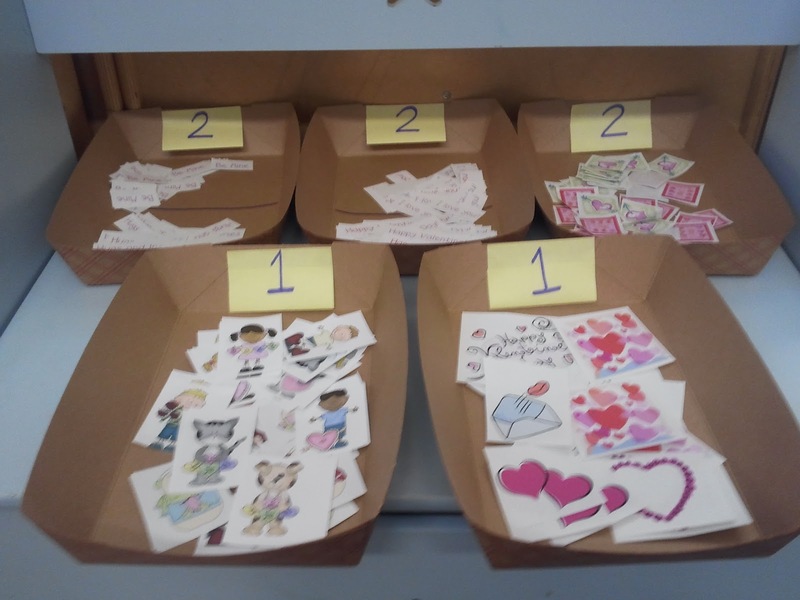 After they were done, I recruited a few fourth graders to help me sort the cards into each child's bag. BEST. IDEA. EVER. It would have taken me a ridiculous amount of time without their help! I hope your Valentine's was fabulous! I was lucky enough to bribe my boyfriend into taking me out for burgers and to see The Vow last weekend. I came home to two very pretty bouquets of flowers on Tuesday. What a sweetie! I remember sorting those Valentine's last year, they really rack up the love notes! 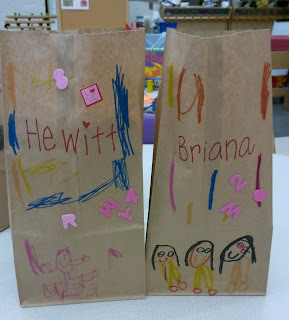 I am loving those little people on the bags-so cute. I tape the kids bags up on the cabinet doors (about 10 per door!) in alpha order by first name. 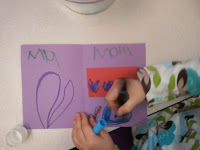 Then I have an adult (University student) help them put cards in. Some are REALLY good on their own! Some need LOTS of help! LOL!